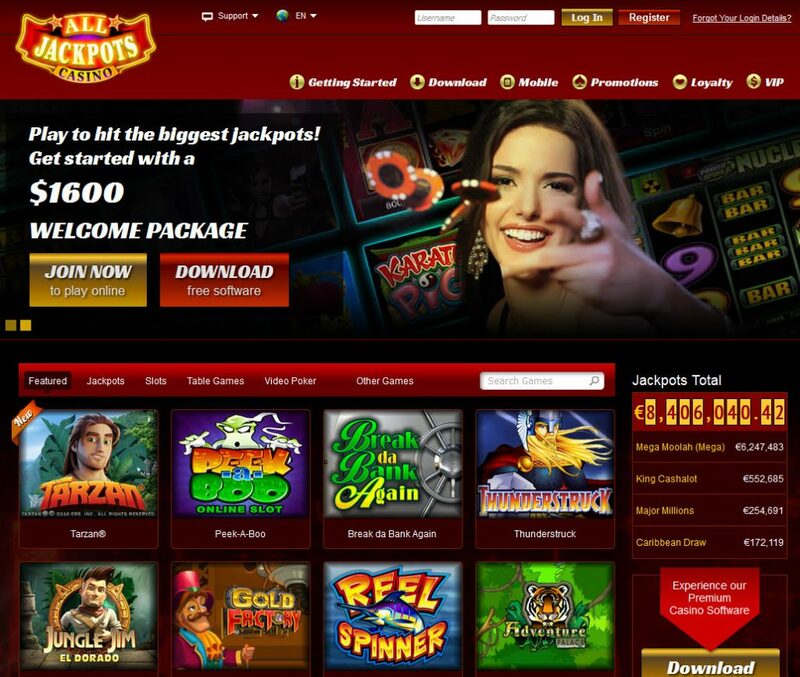 Yet another member of the Jackpot Factory Group is the All Jackpots Casino. Although this casino may be unknown to some people, the parent company has been around for several decades leveraging the very sophisticated Microgaming casino software. 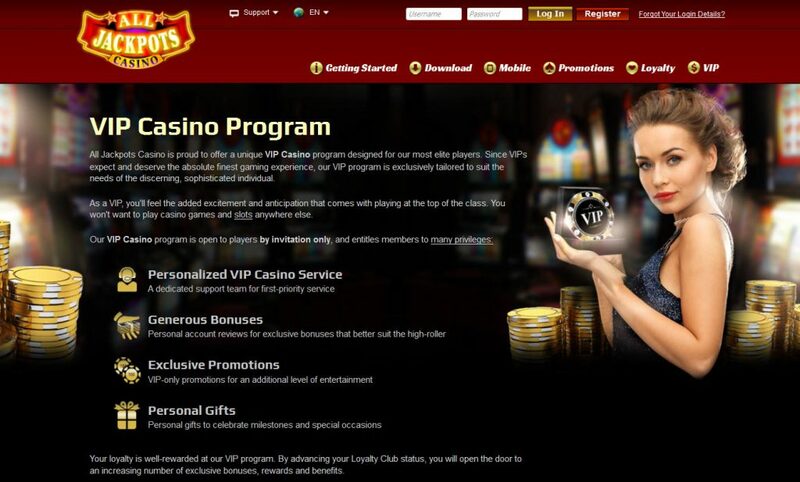 At some point in the rise of this group, they were widely regarded as one of the most successful online casino groups around and even though they took a hit when concerns began to grow about their slow rate of payout and a very stringent withdrawal limit, the group became more flexible in order to maintain its business status. As said earlier, all casinos owned and operated by this casino group All Jackpots Casino inclusive runs on Microgaming software giving it a very professional and crisp feel. There is no lag or dull moment from the moment you access the casino site and regardless of the computer you are using, you will get the best value for your money. To whet your appetite, it is important to know at this point that this casino has in excess of 400 slots games making it a haven for slots lovers and when you behold the wide variety of the slots, it is difficult not to be overwhelmed. Apart from the normal slots games, the casino has over 25 Progressive Jackpots and a large library of card games. The video poker array is about 40 varieties strong and the casino offers a generous package of baccarat, blackjack, craps and roulette for your enjoyment. The mobile app of All Jackpots Casino doesn’t run on Mac OS unfortunately but then, users of iPad, iPhones and other iOS devices, you can still leverage the in-browser gaming option to enjoy to the maximum all the goodies that the casino has to offer. There is no need to make any installations, all you need to do is to enable flash on your computer and voila, you have not less than 200 games to choose from. As handy and sleek as the mobile casino is, it doesn’t have the number of games that the web version has but what it lakes in number, it makes up for in ease of access. Good news for players of the casino is that like all Microgaming propelled casinos, all the jackpots are within a network. What this loosely translates to is that whatever you stand to gain in All Jackpots Casino is influenced by the number of people playing in any of the hundreds of Microgaming casinos worldwide. So as the amount winnable increases, so does your chances of winning big. Apart from the Progressive Slots, there are lots of slot and blackjack events that members can enjoy. More so, in our own experience, for those eyeing the big money win, there are very few games that can offer you as much as Mega Moolah or even Dark Knight Jackpot so you should keep an eye out for that. Banking in a casino has never been easier than what All Jackpots Casino has put in place, to ensure that players have no hassles when transacting at the casino, there are load of payment platforms supported including but not limited to credit and debit cards, Paypal, Skrill, Neteller and the likes. From when you demand to withdrawal your funds to when your bank account is credited is not more than 48 hours which is still reasonable considering what obtains in other casinos. There is also a 5000$ limit on withdrawals on a weekly basis. Again if you want to make a withdrawal that is more than 5 times whatever you have deposited in any of the casinos owned by the group, it will be declined. It is in fact very important to ensure that you read through the notice so that you understand what their stand is on this point. Although many people think this is stringent, it is a way to ensure sanity in the system. When you earn an amount that is very huge, many players tend to want to pull out all they have won and this in no way sustains a casino. However, despite all this measures, with perseverance, you can get all your money. 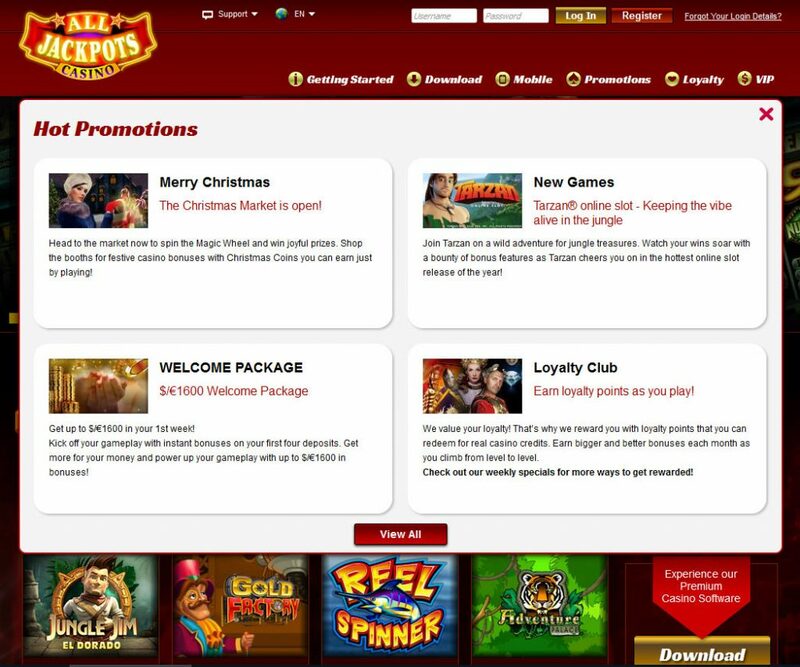 On the bright side, most times when you deposit, you get 100% bonus apart from the about $1600 welcome bonus and a very generous package of free spins for your enjoyment. The customer support at All Jackpots Casino is world-class with a combination of standard instant messaging, email and telephone platforms to ensure that regardless of player’s nationality, they are well catered for. The phone platform also has dedicated lines for players residing in Australian, New Zealand, Sweden, Greece and Canada. A different number is also available for players residing in other parts of the world not serviced by the dedicated lines. The casino is licensed by the Maltese, Lotteries and Gaming Authority and its payout and RNG rating is validated by eCOGRA.